Peel and chop the onions, garlic, carrots, and celery until fine. Halve the bell peppers, remove the stalks and seeds. Roughly chop the bell peppers and place a large saucepan over medium high heat. Add 2 lugs of olive oil and all of the chopped vegetables. Add the chili powder, cumin, and cinnamon with a good pinch of salt and pepper. Stir every 30 seconds for about 7 minutes until softened and lightly colored. Add the drained garbanzo beans, kidney beans, and canned tomatoes. Add the ground beef, breaking any larger chunks up with a wooden spoon. Fill 1 of the empty tomato cans with water and pour this into the pan. Pick the cilantro leaves and place them in the refrigerator. Finely chop the washed stalks and stir in. Add the balsamic vinegar and season with a good pinch of salt and pepper. Bring to a boil and turn the heat down to a simmer with a lid slightly askew for about an hour, stirring every now and again to stop it catching. 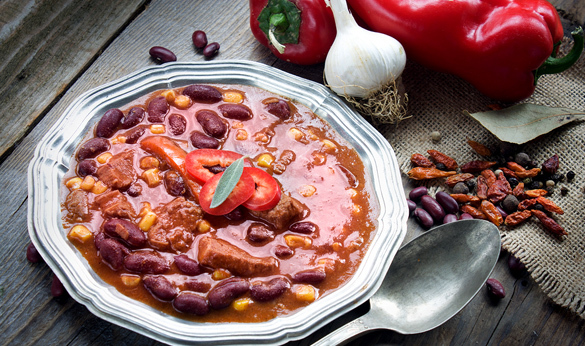 Serve chili con carne with rice and sprinkle fresh cilantro on top.